David Harewood has one of those faces that you instantly recognise, one that you just know you’ve seen many times over the years. But despite a successful career spanning well over two decades he’s never quite made it to household name status. His starring role in breakout hit US drama Homeland, however, looks set to finally change all that. The show centres around a US prisoner-of-war who is unexpectedly released after many years in Afghanistan. While he returns to a hero’s welcome, a brilliant but flawed CIA agent has reason to believe that he may have been ‘turned’, his release being simply the first step in a major terrorist plot against the US. 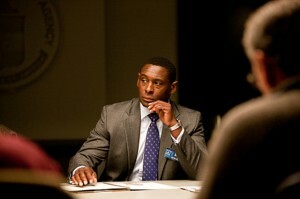 A major member of the central cast, Harewood effortlessly holds his own against superstars such as Claire Danes and Damian Lewis playing CIA Deputy Director David Estes. To celebrate the show finally arriving on UK terrestrial TV, he agreed to talk to New TV Shows about his thoughts on the show and his career in general. In fact, he was so generous with his time that we’ve split the interview into two parts — click here for part to of our interview with David Harewood. First of all, congratulations on your recent MBE [for services to drama]. As recognition of your work on stage and screen over the years it must have been a really proud moment for you. It was — I’m obviously very, very proud of it. I’ve been banging on for nearly 25 years now, so it’s nice that, as you say, you finally get a little bit of recognition. I think together with the success of Homeland it’s kind of a perfect storm for me because I’ve had the recognition personally and also finally I think professionally, so yeah, I’m in a really good place at the moment. It’s true. I thought it was a tax bill so I didn’t open it for three days! I literally left it on the side. You know, I have this phobia of brown envelopes — over the years, I know they contain bad news. So I just left it there and then I plucked the courage up one Saturday night and ripped it open. I was completely, completely gobsmacked, I mean I really nearly fell over. I had to read it again and the pride just welled up. It was a really great day, partly because my kids were there and they got to see inside the palace, which, for two young girls to actually go to the palace was just out of this world really. It was a great day all around. As you say, you’ve been acting for a long time now. You’ve played so many roles on stage and on screen but before Homeland, was there one particular role that people would come up to you and say “that’s what I recognise you from”? That was exactly it for me! I was one-and-a-half episodes into Homeland and I was thinking ‘I’ve seen this guy in so many things’ and I just couldn’t put my finger on what it was I remembered you from so vividly. And then suddenly it clicked: Game On! Yeah, exactly! And again, for a lot of people it would be something I’ve done on stage. I’ve enjoyed a great stage career so people will often remember seeing me at The National playing Othello or Hotspur [in Henry IV]. But it’s nice that I can finally perhaps answer that question with ‘Homeland‘ and have the conversation end there! 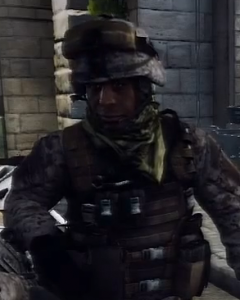 You were involved with Battlefield 3 which seemed like a bit of a departure from your usual roles. How did that come about? I’ve been badgering my voiceover agent for a while now about getting into that genre. I’m a big gamer myself and the games are getting so sophisticated these days that I thought ‘surely there’s a role for me in there somewhere’. Before I went to America to do Homeland they phoned me up and asked if I’d be interested in doing a voiceover for a video game and I thought ‘wow, at last, here it is’. I got the script and I couldn’t make head nor tail of it; it was just complete nonsense. When I saw ‘BF3′ on there it piqued my interest and I looked it up online — as soon as I realised it was Battlefield I thought ‘wow!’ and was immediately really excited. It was also a good chance for me to try out my American accent. Until then I hadn’t actually done one. I was a little bit nervous doing it but it turned out to be great practice for Homeland. I was so excited about it — putting on the computer suit, I was a like a kid in a sweet shop, really so excited as a huge gamer. To actually be in a game, it’s heaven! Yeah, because you did the motion capture stuff as well as the voice over work, right? What kind of games are you generally into? All sorts. I like Uncharted a lot. First person shooters, role-playing games, driving games — I used to be really into Gran Turismo. I’ve got piles of them. Occasionally when I’m trying to get away from the kids I’ll go downstairs and crank up a game. I’m thinking of getting a Kinect next. There are many nights when I’m in America and not filming when you kind of think ‘what shall I do?’ — I’m trying to give myself as many things to do as possible that I don’t have to pay for so I’m probably going to grab a Kinect and get really fit with one of the fitness games. There’s been a lot made recently of your comments on the lack of opportunities for black actors in the UK as opposed to in the US. What do you think the issue is behind that? I’m a bit disappointed with myself really for allowing a personal frustration to become so public because it’s dominated a lot of my press of late. I regret that because I really wanted this to be a good news story, you know, the success of Homeland and me being a part of that. I think I’ve been misrepresented quite a lot. When you take the argument out of context it becomes quite sensationalist. The point I was trying to make was that there is no doubt that the characters I get from America are just far more complex, more authoritative than the characters I get here in the UK. It’s not just myself but a number of black actors — we’ve found the US a place where we can really stretch our talents and play characters that aren’t necessarily colour-specific. They give you the range, the options that we’re looking for as strong actors. I can only say that the characters in America just seem more complex — particularly when it comes to television. I don’t know why that should be, I don’t know why we don’t create those characters in the UK. I really couldn’t put my finger on it and I’d hate to try to because as soon as you do you’re accused of criticising — one of the headlines was ‘Harewood slams the UK film industry’! I wasn’t doing any of that; I was just pointing to the fact that the characters I get in America are just far more complex and I’m not the only one who thinks that. But as to why that should be I really have no idea. As we touched upon earlier you’ve previously played some big roles on stage here in the UK — is Broadway something you’d like to look towards now that Homeland has been such a success or are you going to try and cement the screen roles while you’re recognised for that? No, I’d love to replicate the success I’ve had here over there. I’d love to do Broadway, I’d love to do off-Broadway. I love acting — I’m not necessarily interested in just disappearing into movie stardom as it were. I love playing characters — if I can find a great character on stage then I’ll do that. I’m not really interested in just having a long move career. I would like to do more movies, don’t get me wrong — but if I can work on stage in America or back here in the UK then great. I’m very excited about what the success of Homeland could possibly do for me. I’m in a win-win situation because I love the stage and I also love the screen so whatever comes up I’m looking forward to it. We’ve spoken about the fact that you’ve enjoyed a long career but did landing such a major role in a show like Homeland feel instantly like a major milestone? Oh yeah. It’s the first time I’ve worked in America regularly, it’s the first time I’ve played such a central, authroritative character in such a big show, I’m working with great actors — it’s a huge milestone for me. It’s a huge turning point for me and hopefully it’s going to open up many more doors. But I’m really very excited about the show and what it can do for my career. I’m just ecstatic about it, it definitely feels like I’ve taken another step. Just in terms of my abilities; when you play a central role, you have to take on more responsibilities. I certainly feel just as I did when I played Othello at the National, like I’ve made another leap into another category. I feel that playing Estes has been another leap for me in terms of my professional career, just taking on that responsibility and working with the actors. The quality of the actors I was working with has definitely stretched me and made me a better actor. Are there major differences in working on a US show as opposed to a UK one? A little bit. I suppose it’s what the old rep system would have presented actors with; it’s given me the ability to play the same character over the course of six months at the level that the guys are writing Homeland on. You really need to be disciplined with your character, you need to be able to interpret scripts quickly — but at the same time it gives you the time to deepen your character. I struggled a little bit at first during the first season because I couldn’t quite get a handle on my character but by the end of the series I felt very comfortable in his shoes. Playing the same character [for so long] — we don’t do that in the UK these days as much as we used to. In series like The Vice, London’s Burning, all those big shows you could play the same character over a number of years and really get to know it. I suppose we do it with the soaps but it’s a different thing when you’re dealing with the high-end dramatic serials. For me, it’s the chance to play the same character over a number of years and getting under his skin, getting to know him — it’s something they kind of tend to do more now in America than in the UK. You spoke about your two daughters earlier — how do you cope with being away for so long at a time when you’re working on a project like Homeland? Skype! But there’s only one thing with Skype and that’s that you can’t reach in and grab them. Sometimes you just want to grab them, smell them, pick them up. But they came out and spent some time out there with me last year and it was fantastic. It was 90 degrees every day, there was a pool on the roof, they just loved it. Jumping in the pool every day, swimming, sitting in the sun, spending lazy afternoons eating pizza — they had an absolute ball and I hope very much that we can do the same thing this year. Homeland has finally started showing in the UK on Channel 4. It’s a long time since the show aired in the US, which is something you made a point of highlighting on Twitter. Do you sympathise with the guys in the UK who keep up with news on US drama and have had to wait this long to see something that’s been such a big hit? I really do. I have to apologise to Channel 4 for some of my tweets! It’s a shame because most people have probably already seen it probably by downloading it — one way or another they’ve probably got their hands on it. It’s a shame that they’ve had to wait so long and it’s also been a shame that because of the scheduling Channel 4 haven’t really had an opportunity to put out poster campaigns out for it. We can only hope that people will find it but it’s a shame that there are more posters for [Channel 4 reality show] My Big Fat Gypsy Wedding than there are for Homeland — a real shame. Unfortunately that seems to be the way of things at the moment with reality shows taking over. Channel 4 used to be the home of quality US drama really if you think of The Sopranos, Six Feet Under, The West Wing — but even the later seasons of those shows ended up being scheduled in the middle of the night or shipped out to the lesser-watched digital channels. It seems generally with the UK that these quality US shows are bought and not necessarily made the most of. Exactly. I mean, I’m not saying it’s any more fractured than it is in the States but they are across a huge range of channels over here. You have to look deep and hard to find the right show. In a way I’m glad it’s on Channel 4 because at least it’s on a terrestrial channel but I just hope that enough people know that it’s on and catch it. I’m sure people do but I also think that most people have probably, by hook or by crook, seen it one way or another. On that note, I wanted to speak to you about people downloading shows. I think there’s an argument that says the word of mouth it can generate can actually help DVD sales of shows that haven’t been promoted as well over here or aren’t scheduled as positively as they could be through word of mouth. An example for me is Breaking Bad over here. I’ve spoken to probably 15 people now and said ‘look, this show is amazing, you’ve never heard of it but you have to watch it’ — and a bunch of them have been out and bought the DVDs. Yeah, I can’t understand why nobody’s picked Breaking Bad up [in the UK]. It’s one of the best TV series I’ve ever seen. I showed it to my girlfriend when she was in the States and she didn’t think she was going to like it but she ordered me the next day to go out and buy the entire box set. We sat there every night and watched three episodes back to back and we’re now huge fans. It’s one of the best things I’ve seen in my life. Quite why none of the big channels have picked it up I don’t know. I wonder if it’s perhaps a tough sell to the audience when you try and precis it down — this guy who’s terminally ill and starts selling drugs, it perhaps doesn’t appeal to a wide audience but it obviously goes much deeper than that. Much deeper than that, yeah. I suppose it is a hard sell. Mind you, it’s like The Wire. Nobody watched The Wire when it was on TV, everybody watched it with a box set. I suppose it’s just one of those things — you either catch it or you don’t. I’m hoping Channel 4 keep Homeland and it’s as big a success here as it was in America. For somebody who doesn’t know much about the show and hasn’t gone down other routes to see it, what would you say to them about the show? Why should they be tuning in on Sundays? It think it’s probably one of the best examples of high quality writing that deals with current-day situations that there has been in years. The writing is high quality, the acting is superb, all the central characters are fantastic — Claire Danes, Damian Lewis, Mandy Patinkin — just superb actors. It’s a combination of great writing and great acting. If you like deep-thinking psychological thrillers then Homeland is for you. It’s a slow burn thing — it’s not for everybody but it’s highly intelligent writing and high intelligent drama. If you want car chases and thrills and spills it may not be for you but if you like to really sit and try and work things out it’s probably the best example of quality US writing that there’s been for years. The cast is remarkable. Not only the main star names of Claire Danes and Damian Lewis but also a great extended cast — yourself, Mandy Patinkin, who everybody knows from The Princess Bride but is another guy who has had a remarkable career both on stage and screen, through to people who aren’t necessarily in every episode like David Marciano who was wonderful in Due South and The Shield and again in this. The whole cast is amazing. It really is. Obviously when you read the scripts you mostly concentrate on your own lines but then you sit down to watch an episode and you realise there’s some fantastic work being done by everybody — even the guest spots are fantastic. It seems to have brought out the best in everybody. What about your character, David Estes? He’s really quite a complex character and you’re never quite sure what side of the line he’s walking on. No, not until the very end — and neither was I when I was playing him. It was a difficult character to play because he’s the youngest ever deputy director of the CIA, he wants to be the head honcho at the CIA. He wants to mould the place in his own image, he wants to be the ‘new broom’. When I was researching about the CIA, there has been this big change since 9/11 with this emphasis on technology, on drones, on dispensing with the old ways of sending guys out into the field, the old spy network, etc. I think Estes is very much a new broom, he wants to make use of new technology, of drones, new ways of spying, new ways of surveillance and analysis. It’s all about analysing information and I think Estes is representing this new way of approaching analysis, whereas I think [Mandy Patinkin's character] Saul is very much old-school. He’s extremely ambitions, highly intelligent — but I think he’s perhaps sold his soul a little bit, perhaps sold a little bit of himself in order to get to where he is. I think he’s aware of that. He still has a heart but he’s quite cold inside. He doesn’t like his position to be threatend, his authority to be threatened in any way. He realises [Claire Danes' character] Carrie’s brilliance but also realises that she is reckless and that he has to be very wary of her approach — and not to give too much away, he’s proved right on several occasions as her methods are unconventional to the point of being dangerous. Somebody in Este’s position cannot afford to have such a loose cannon on his team and he will, if necessary, dispense with her. I think he’s very guarded, very ambitious — but I think more than anything else he’s an absolute partiot. He’s doing this not just for himself but for the defence of his country. The show won the Best Drama award at the Golden Globes beating off stiff competition from the likes of Game of Thrones and Boardwalk Empire — that must have been such an amazing feeling. Oh, it was. I still pump my fist when I watch it on YouTube! To sit there and hear the name Homeland called out it really was one of the most memorable nights of my life. Just a fantastic atmosphere. Because we film it in Charlotte, which is quite a small town, we missed the mania there was for the show in LA and New York. Walking down the red carpet it was extraordinary the comments we were getting from the interviewers. It seems to be one of those shows that people have tuned into with regular passion and sat glued throughout the hour watching it almost through their fingers, thinking ‘what on Earth is going to happen next?’. To create that sort of anxiety in a TV show, you don’t really get that very often. Going back to what we were talking about earlier, I got that with Season 2 and 3 of Breaking Bad, you know. I was going ‘oh my god, what’s going to happen next?’, where you just cannot envisage what’s going to happen the next day. What’s Jesse going to do? What’s Walt going to do now to get out of this situation? I think the fact that we can create that [kind of thing] at such a level is testament to the quality of the show and also to the subject matter. It’s one of the first major terroroism dramas that has really gripped people. It’s frightened them, it’s gripped them — and the whole idea that the all-American hero could in fact be a terrorist? It’s really spun their heads. I think that’s the secret of the show: it’s making people really question what is right, what is wrong. It’s really blurred the lines and I think that’s just been fantastic — it’s humanised everybody, from terrorists to good guys and bad guys. Nobody’s [got off] scott free, even the FBI’s come in for some flack at some point. It’s just really well put together. 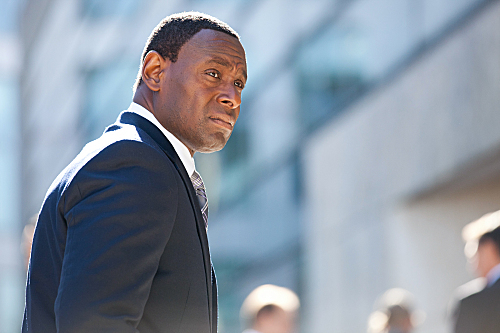 Click here to read part two of our interview with David Harewood. 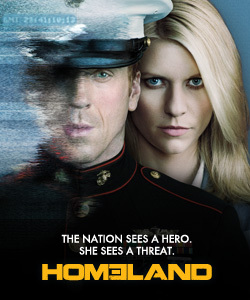 Season 1 of Homeland is currently showing on Channel 4 on Sunday evenings in the UK. Catch up on previous episodes on 4oD, starting with Episode 1. Season 2 will air on Showtime in the US later this year.